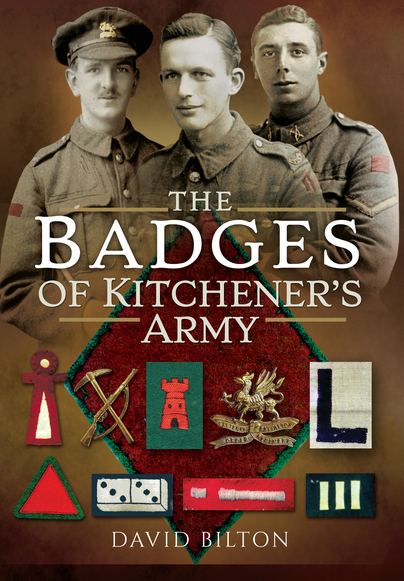 You'll be £24.00 closer to your next £10.00 credit when you purchase The Badges of Kitchener’s Army. What's this? Order within the next 6 hours, 35 minutes to get your order processed the next working day! It is prodigiously illustrated and contains much information, like why a shape or colour was chosen, when it was adopted, what size it was, whether it was worn on a helmet, what colour the helmet was and even what colours were used on horse transport; the majority of this rich and detailed information has never been published before. What helps make the information accurate and authoritative is that much of it comes from an archive created at the time and from personal correspondence with hundreds of veterans in the 1980s, many of whom still had their badges and often had razor-sharp recollections about wearing them. The book will also provide some comments from these veterans. At a minimum this is an important addition to the ever-growing body of reference works about the war. However the book also offers much more than this; genealogists, military history enthusiasts, military modellers, collectors, and re-enactors will all benefit from consulting this invaluable record. Excellent work has been done on museums and regimental archives and journals to illustrate as many as possible. The comprehensive help the author received from institutions and individual collectors is fully credited – and the end result reflects the considerable labours involved. In all of this, the work done by Bilton is great. This attractive book with excellent colour and black and white illustrations is based on over thirty years research. The authors interest was stimulated when he was shown the important IWM collection which saw its beginnings in 1917 when units were invited to provide details of the badges they were wearing. Over the years the author was able to interview many veterans, now long since gone, who could recall will great clarity the badges they wore. The book is clearly laid out and firstly takes the reader through the formation badges worn by the 9th to the 41st Divisions, then on through their constituent brigades and then Service battalion by Service battalion of 69 different infantry regiments in order of seniority, from The Royal Scots to The Rifle Brigade. There is no doubt this elegant book, packed with information will fast become an essential reference work on this subject and perfectly complements the latest MHS Special Number. Most highly recommended to all First World War badge enthusiasts. There is no doubt that this is a vital reference book on the Great War, whether it be the military or family historian. Documentary masterpiece Without a Doubt. It's a hugely informative and visually impressive work, and a fantastic resource for general enthusiasts and those who collect old photos. can’t get a better book on Kitchener Battalion insignia. This is a book that has been many years in the researching and it will be an extremely important reference resource for anyone with an interest in the Great War and in particular those pedantic individuals like me who want to analyse every last pixel of a military photo. This is one of those books which I can not only enjoy, but simple sit back in admiration for. This is one to keep among any reference collection for detail on British Army Uniforms, particularly in this case for WW1.